Colorado is our 26th state! We have already done a day trip into CO when we visited the Rocky Mountain NP but this is our official week stay, with the RV, in this state. Now we can put the Colorado sticker on the vinyl US map. We drove from Moab, over the Rocky Mountains, past Vail and other ski resorts while admiring the snow. This is the highest elevation MF (Millienium Falcon, the RV ) has traveled. This tunnel is on Interstate 70, under the Continental Divide, in the Rocky Mountains. The elevation of 11,158 feet above sea level, makes this one of the highest vehicular tunnels in the world. The tunnel is 1.7 miles long, making it the longest mountain tunnel and highest point on the Interstate highway system. We arrived in Denver and parked at the beautiful Cherry Creek State Park. We loved walking around in the fallen leaves. We met our friends, the Baker’s, on our Disney Cruise back in 2015 and have stayed in touch ever since. We have been excited to meet them for dinner since we started this adventure. They suggested a Denver touristy restaurant, that is also on Roadside America, called Casa Bonita. Casa Bonita calls themselves a “entertainment” establishment. In 2015, the Historical Society decided to make the Casa Bonita a historic landmark of the city. This place feels like you stepped into the World of Disney. It starts out by standing in line while you wait to order, then you pick up your food ‘counter service’ style and then are lead to a table. While you enjoy your Mexican dinner, divers preform tricks into a shallow small pool in the middle of the venue. They have an entertainment schedule posted at every table so you know what’s coming up if you want to go stand on the bridge to get a better view. The kids ran around, walked through a miniature haunted house and played in the arcade. They met us back at the table to share the most amazing sopapillas my mouth has ever tasted. We had fun Baker’s, let’s plan another Disney Cruise! And here is our forecast for Sunday! Snow and 17 degrees! We woke up freezing! Our aqua hot could not keep up with the drop in temperature. UGH! This is why we are headed south. The girls were thrilled with the first snow of the season. They dug out their winter gear and headed out to play while I packed for our trip to Atlanta later this afternoon. The girls and I flew home to stay out our cabin in Ellijay one last time before we closed on it Friday. Chris had business in Boston so he couldn’t join us. Home visit on next blog., click here to see that post. when he got back from his work trip to Boston. Colorado Springs was built to attract the wealthy back in 1871 and it did just that. By the first of decade of the 20th century it ranked among the wealthiest cities in the country. This park has towering sandstone rock formations. The Kissing Camels, Siamiese Twins, and balanced rock are the most recognizable. The Perkins gave this land to the city in 1909 with the promise it will forever remain free to the public. We stopped by the visitors center to pick up a map and found small but informative exhibits. We discovered that it would cost $20 to watch the 10 minute film so we passed and decided to spend the $20 in the gift store on our Colorado keychains and magnets. The park is small, easily seen in a few hours. It’s free to drive through and we were parked right next to it so we drove through the main road overtime we went somewhere. We really enjoyed our 4 RT hike from Parking lot 2. The picture of Balanced Rock will be added later when we can find Abby’s phone. My phone had died and I didn’t bring my regular camera today. We met the Caudill Family 4 years ago when they had moved near us in Acworth, GA. Sarah and I volunteered together in Mrs. Ewer’s 3rd grade class where Abby and Marley became fast friends. Three years passed and we were at school for Muffins with Mom and they told us they were moving to Colorado. We shared with them that we were moving into an RV to travel and immediately made plans to get together when we reached Colorado Springs. They invited us over for a home cooked meal and fellowship on Tuesday night. It was so fun to hang out a someones house- we felt right at home. We had a wonderful time! Thank you Caudill’s. We called ahead to ensure we’d be able to visit because of fluctuating security levels. We entered the North Gate and headed to the Barry Goldwater Air Force Academy Visitor Center to pick up the self guided tour map. We walked from the VC, along the designated trail to the Cadet Chapel. Made of aluminum, glass and steel, the Cadet Chapel has 17 spires that resemble a light formation of planes ready for take off. The four major religions on campus, have their own worship center located inside the Chapel. The Protestant chapel, the Catholic chapel, Jewish synagogue and Buddhist temple were beautiful on the inside as well. We ran around this courtyard of bronze sculptures, looking for the type of plane, Chris’s great uncle flew in WW II. It turns out he flew both the P-40 and the P-47 both pictured with the girls. The visitors center has many exhibits including a replica of the dorm rooms and an inspiration film. The United States Olympic Committee has three Olympic Training Campuses for its Olympic and Paralympic athletes. Colorado Springs OTC was the first to be built, and has been the home of the U.S. Olympic Committee since 1978. We took the guided tour ($15 each) which started with an inspirational video. Visiting this center and the Air Force Academy in within hours of one another meant that Mackenzie went from wanting to be an Olympic athlete to signing up for the academy. Our tour guide took us into the wrestling room, the front of the aquatics center, the shooting range and two gymnasiums. He stopped and introduced us to Olympic medalist as they would walk by. I caught a picture of, Ryan Boyle, a silver medalist for the Paralympics in cycling. He has a very inspirational story you can read about here. We were able to visit the High-altitude training center and food science kitchen. They have an anti-gravity treadmill that you can train on if you are recovering from a break or sprain. Chris worked for USA Team Handball from 1995-1996 as they prepared for the Olympics in Atlanta. This is where Chris met, Matt Ryan, captain of the 1996 team. They lost touch for the next 15 years then one day, in 2011, at a local playground, they ran into each other and our families have been great friends ever since. It is an interactive, education-focused center where we got our STEAM lessons completed. 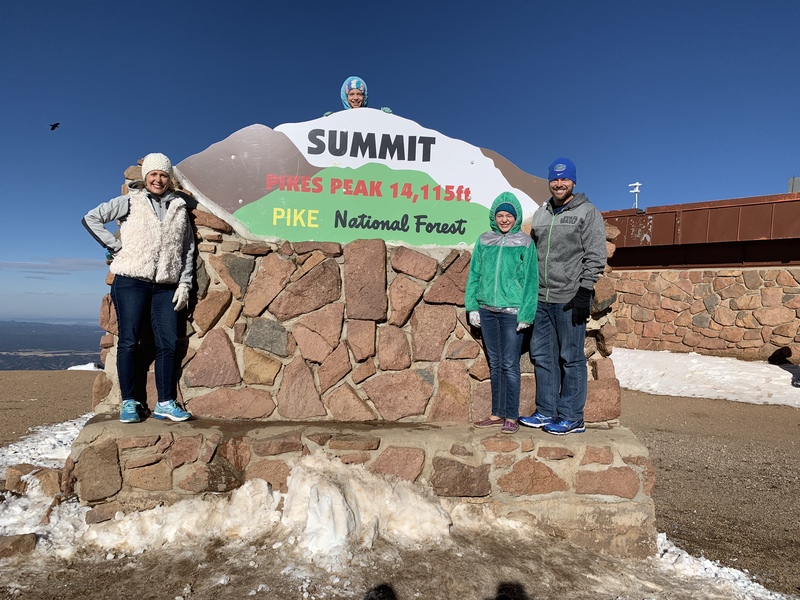 You can get to the top of America’s Mountain to Pikes Peak by either climbing, driving or taking the Cog Railway (the highest train in America). We chose to drive to the summit at an altitude of 14,115 ft because I love to drive mountain roads but also the choice of taking the Cog Railway was not available because it is shut down for a year for renovations. It does cost $40 per vehicle to drive to the top. There are over 150 turns and at all of them you want to take a picture. One of the pictures you can see a set of switchbacks towards the top that looks like a ‘W’. You must try the donuts they serve at the cafe when you reach the top. Pikes Peak is one of Colorado’s 53 fourteeners-peaks that rise more than 14,000 feet above sea level. Colorado is the highest state in the nation. There was a 30 degree difference in the temperature from the bottom to the top. It was 19 degrees at top! The views are breathtaking, literally. Cool! Great architecture on the Air Force Academy! Garden of the Gods looks pretty cool. It is! But if you like that landscape, check out Moab and Arches National Park- way cooler!